Classification follows Wells (1956) as modified by Owens (1986a, b). The genus marked by a cross ( ) is known only from the fossil record, whereas the unmarked genera contain living and, in some cases, fossil species as well. The micrabaciids are known from the Early Cretaceous (about 135 million years ago) to the Recent. Although not commonly collected, they are found in all ocean basins, including off continental Antarctica, at depths of 49 to 5000 m (Keller, 1977), making them the second deepest-living coral family. Micrabaciids are exclusively azooxanthellate, and all are solitary in growth form, laying unattached on soft substrates. 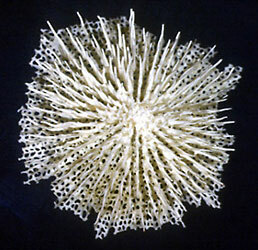 The largest known specimen is 51 mm in calicular diameter (Letepsammia, see Cairns and Zibrowius, 1997), but most species are less than half this diameter. Thirteen living species are known (Cairns et al., 1999) and an additional 22 species have been described as fossils. One species (Letepsammia formosissima) is known to host ascothoracidan crustacean parasites (Grygier and Zibrowius, 1985). Squires (1967) and Owens (1984a, b) discussed the adaptations of the species of this family to the deep-water environment. According to Squires, as species gradually invaded deeper water, the polyp increased in size and the skeleton decreased in size, resulting in a progressive increase in the polyp:corallum ratio. Indeed, many deep-water Leptopenus appear to be primarily polyp with an inconspicuous, fragile, usually fragmented corallum embedded in its tissue. With increasing depth, the skeleton also reduces its number of septal trabeculae and increases its septal and thecal porosity, all of which lead to a small, very fragile, porous skeleton. The skeleton of a cleaned Leptopenus or Letepsammia is so porous that, when held to a light source, one can see through their bases. Owens (1984b) suggested that the micrabaciids were preadapted for deep-sea life by having ancestors that had auto-mobile coralla, a character that also benefits from having a light corallum. Descriptions and illustrations of many of the Recent species are given by Cairns (1989). A discussion of the family and its Recent genera are also provided in that paper. Cairns (1989: 13) provides a key to genera. Solitary, free, discoidal coralla, usually having a flat or slightly convex base. Septa and costae alternate in position, linked by simple synapticulae, producing a highly porous base. Higher cycle septa and costae increase in number by bifurcation. Septa composed of a single fan system of simple trabeculae, often producing a laciniate upper edge. Septa sometimes highly porous, like Swiss cheese. 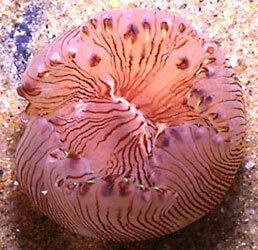 Polyp completely invests corallum. No phylogenetic analysis has been made of the genera within this family. Cairns, S. D. 1989. A revision of the ahermatypic Scleractinia of the Philippine Islands and adjacent waters, Part 1: Fungiacyathidae, Micrabaciidae, Turbinoliinae, Guyniidae, and Flabellidae. Smithsonian Contributions to Zoology, 486: 136 pp. Grygier, M. J. and. H. Zibrowius. 1985. Diversity and range of scleractinian coral hosts of Ascothoracida (Crustacea: Maxillopoda). Annals de l'Institut Océanographique, Paris, 61(2): 115-138. Keller, N. B. 1977. New species of the genus Leptopenus and some peculiarities of deep-sea ahermatypic corals. Trudy Instituta Okeanologii, 108: 37-43. Owens, J. M. 1984a. Evolutionary trends in the Micrabaciidae: an argument in favor of preadaptation. Geologos, 11(1): 87-93. Owens, J. M. 1984b. Microstructural changes in the Micrabaciidae and their ecologic and taxonomic implications. Palaeontographica Americana, 54: 519-522. Owens, J. M. 1986a. Rhombopsammia, a new genus of the family Micrabaciidae (Coelenterata: Scleractinia). Proceedings of the Biological Society of Washington, 99(2): 248-256. Owens, J. M. 1986b. On the elevation of the Stephanophyllia subgenus Letepsammia to generic rank. Proceedings of the Biological Society of Washington, 99(3): 486-488. Squires, D. F. 1967. The evolution of the deep-sea coral family Micrabaciidae. Studies in Tropical Oceanography, 5: 502-510. Williams, G. C. 1986. What are Corals? Sagittarius, 1(2): 11-15. Page: Tree of Life Micrabaciidae Vaughan 1905. Authored by Stephen D. Cairns. The TEXT of this page is licensed under the Creative Commons Attribution-NonCommercial License - Version 3.0. Note that images and other media featured on this page are each governed by their own license, and they may or may not be available for reuse. Click on an image or a media link to access the media data window, which provides the relevant licensing information. For the general terms and conditions of ToL material reuse and redistribution, please see the Tree of Life Copyright Policies.